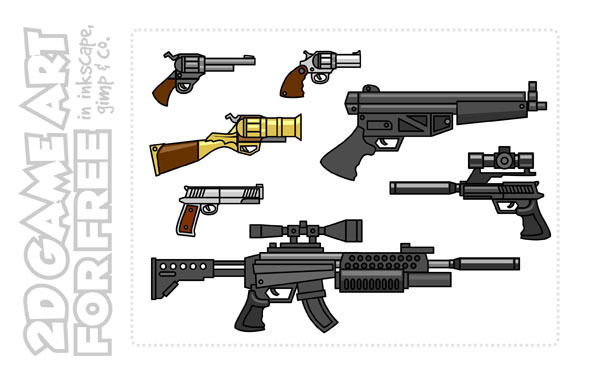 Here's a set of simplified guns rifles [not intended to be realistic or accurate] in a combined and exploded version. The preview just shows a few of them. The explosion splits the guns and rifles into their parts to allow you to assemble your own by combining the assets, scaling, recolouring and altering them to create new, weird and wonderful weapons. There are some 120 bits and piece to combine. That is indeed quite useful for inventory art or such. An easy way to create a hight-map to calculate a 2D normal-map would make this perfect though (yes even many 2D games use normalmaps these days, and it works surprisingly well with pixel and illustrative art like this). just when i am prootyping a shooter!!! These are incredible! As soon as I need to make a weapon I look up these sheets on my HD. Currently using them in http://www.stencyl.com/game/play/23286 but I have tons of upcoming projects where they'll be used. Thank you so much for making them available! Found this set of gun parts by accident in a google search. These are friggen awesome!